An emerging idea as we blur the boundaries between ornamental and food gardening is the Food Forest. Based on principles of Permaculture, it seeks to increase the overall productive value of the landscape, increase species diversity and health, reduce resources needed to maintain the landscape, and provide for anyone (human, animal or insect) to eat from it. 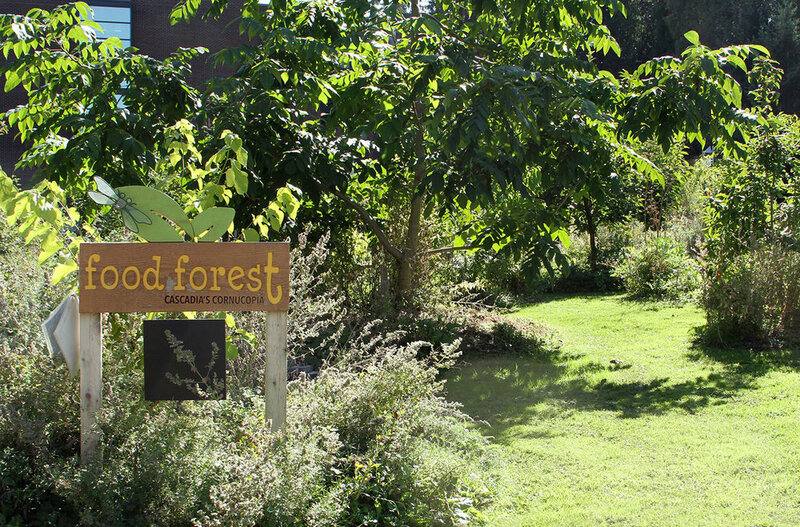 Food forests are modeled after native forests in their ecological functions and layers such as upper canopy, shrubs, groundcovers, root layers, etc. 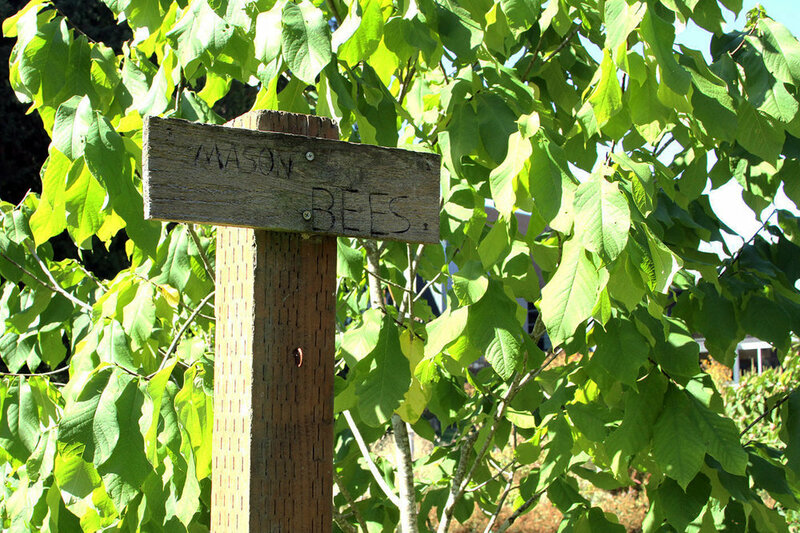 On Seattle’s Beacon Hill, the Beacon Food Forest was established in 2012 as one of the first ideas of its kind — large scale, edible landscape on public land, accessible to anyone who wishes to eat from it. 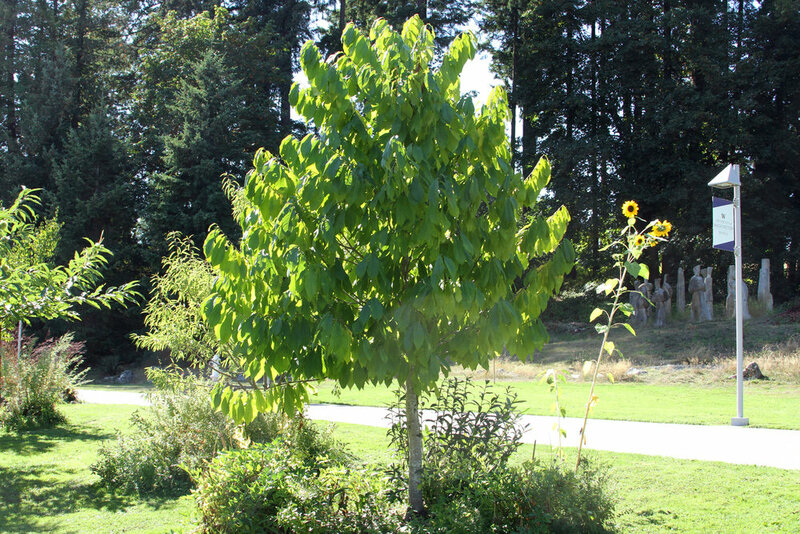 It was launched by a grassroots community effort and planted on land owned by Seattle Public Utilities. It draws visitors from around the country and the world. 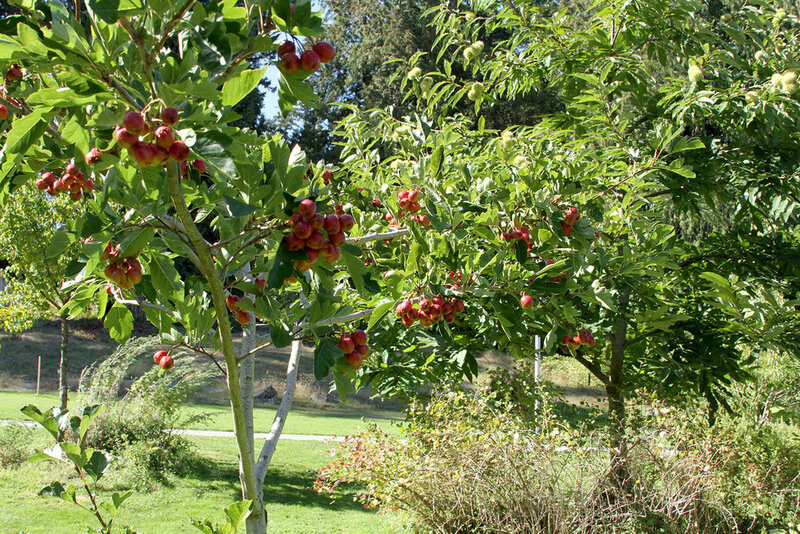 But another project garnering recent attention is the Cascadia College (CC) Food Forest, on the campus shared by Cascadia and the University of Washington, Bothell (UWB). It is one of a few but growing number of college campuses in the U.S. which are maintained using sustainable practices and without pesticides or synthetic fertilizers. In fact, it has achieved Salmon Safe Certification, only the second college campus in the nation to do so. During the planning phase for campus development, Tyson and his colleagues presented several sustainability projects to different groups on campus. "The Food Forest idea rose to the top of the wants list," and a triangular plot near the center of campus was chosen as a starting location. 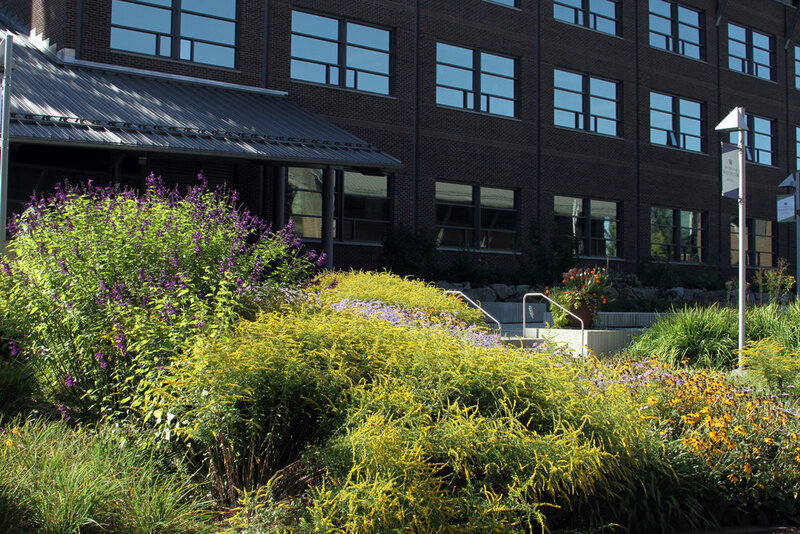 Other projects were added, such as edible container gardens, worm bins and the herb walk that greets everyone entering campus from a parking garage. “Oh, that’s a persimmon tree,” Tyson explains. There are unusual varieties of gooseberry, goumi, aronia, other fruiting shrubs, and herbs sprouting up around the trees' bases, contributing to the layering. Most trees and shrubs are labeled with discrete wood stakes. Next door, the Pollinator Garden towers with late-season yarrows, asters and rudbeckias. These are not your, er, garden-variety fruits, and that’s by design. Tyson wants visitors to see beyond the common apples, pears and plums they typically see. “Besides the sustainable aspect," he says, "this is here to educate and inspire people." 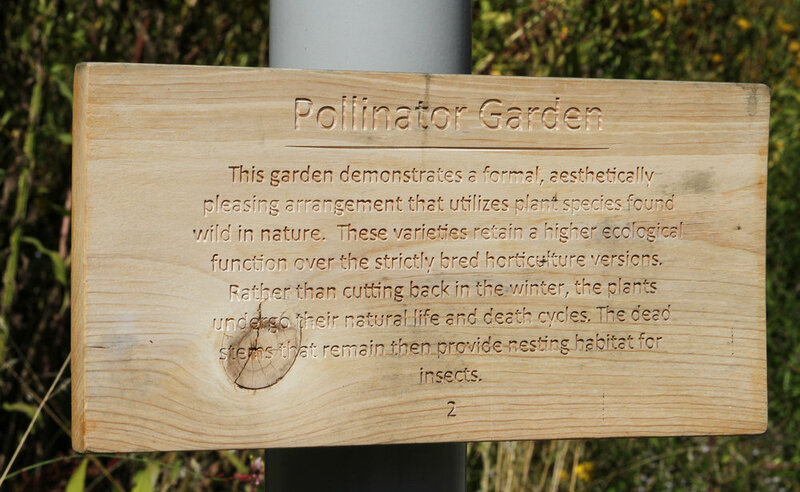 Alexa has produced printed information binders for the Pollinator Garden and Food Forest. "We want people to know what’s available here and how to use it," she says. 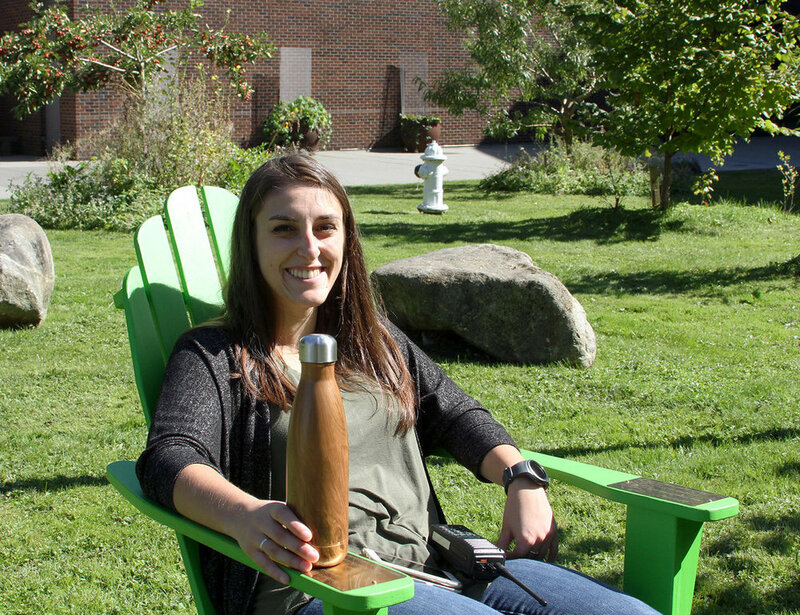 Her future projects include a full-fledged book on these projects, and a survey initiative for pollinators on campus to address the question: "what types of landscapes best support pollinators?" 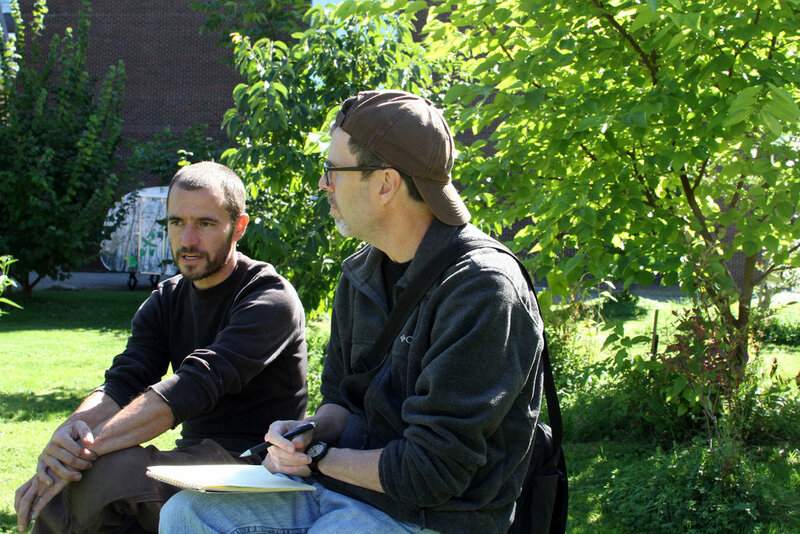 Has it been a challenge to get the campus community on board with sustainable practices and the Food Forest? Alexa and Tyson confirm that there were concerns about maintenance and variation from the "pristine" campus look. Their team has an ongoing mission to address expectations and perceptions of what is "healthy" and what is "beautiful." "We're always reaching out to students and faculty," Tyson relates. "We explain the science behind what we’re doing, help them see the beauty of the landscape differently." 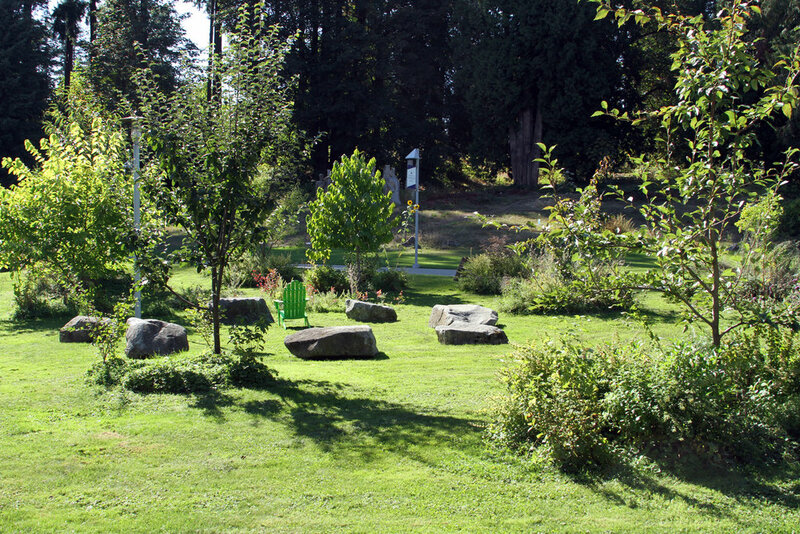 The Meadow has been the most debated, a minimally maintained space (perceived by some as a "vacant lot") in close proximity to newer, modern buildings. But in light of the goals for sustainability, CC administrators strongly supported the idea. Overall, the environmental and cost benefits of adopting these projects, and sustainable practices in general, were quickly obvious. "Within just a couple of months after we eliminated pesticides [in 2006], we saw insects and birds return to the campus in a strong way." In addition, "We reduced our mowing from 2-3 days per week to one day per week." There have been unexpected human benefits, too. Students and staff from Asian countries have expressed surprise to see some of their hometown favorites growing here. And once, while Tyson was cutting down late fall chaff in the Meadow, a man native to Eastern Europe told him how much the plot reminded him of home. "You just never know how people can be touched by this," Tyson marvels. 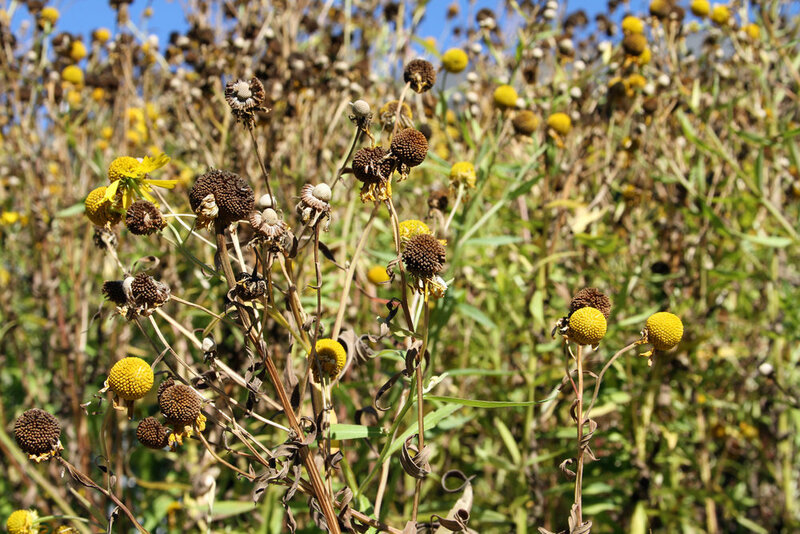 Click for the Food Forest and Pollinator Garden plant lists.